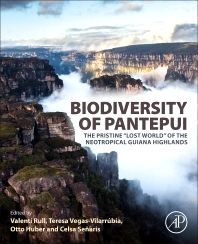 Biodiversity of Pantepui: The Pristine "Lost World" of the Neotropical Guiana Highlands provides the most updated and comprehensive knowledge on the biota, origin and evolution of the Pantepui biogeographical province. It synthesizes historical information and recent discoveries, covering the main biogeographic patterns, evolutionary trends and conservational efforts. Written by international experts on the biodiversity of this pristine land, this book explores the environmental and biogeographical factors, along with the characteristics that make Pantepui a unique natural laboratory to study the origin and evolution of neotropical biodiversity using only natural drivers. Valentí A. Rull is a biologist with a PhD in paleoecology (1990). He is a Tenured Scientist of the Spanish Council for Scientific Research (CSIC) at the Institute of Earth Sciences Jaume Almera, Barcelona. He uses paleocological evidence to study the type and characteristics of biotic responses to environmental shifts, the natural and anthropogenic drivers of ecological change and the role of tectonics and environmental change on the origin of biodiversity. He also works on the contribution of paleoecology to biodiversity conservation. Dr. Rull has conducted his research on several temperate (Pyrenees, Azores Islands), tropical (Andes, Orinoco delta, Maracaibo basin, Gran Sabana, Pantepui) and subtropical (Easter Island) regions. Otto Huber, born Germany, 24.11.1944, resident in Merano (Italy). MSc in Biological Sciences, University of Rome (Italy) in 1971; Ph.D in Plant Ecology, University of Innsbruck (Austria) in 1976. Lived and worked in Venezuela 1973–2002, and part-time 2003–2010. Main research activities: plant ecology in savanna ecosystems of the Central Venezuelan Llanos; phenology of montane cloud forests of northern Venezuela; flora and vegetation of 56 different tepui summits of Pantepui, Venezuelan Guayana Shield. Professor for Plant Ecology at Universidad Simón Bolívar, Caracas (1999–2002); Director of Research (1994–98) and Research Associate (2002–10) of the Botanical Institute in Caracas. Celsa Señaris received her Ph.D. degree from the University of Santiago de Compostela in 2001. From 1991-2003 she was the Curator of the Herpetology collection of the La Salle Natural History Museum in Caracas, and she served as Director until 2012. Currently she is a Researcher in the Ecology and Genetics Laboratory at Instituto Venezolano de Investigaciones Científicas. Her research focuses on the Guianan herpetofauna, studying the systematic and biogeography of the amphibians and reptiles in that region. Also, she has been a Professor in the Universidad Central de Venezuela. She is the Venezuelan Chair of the Amphibian Specialist Group-IUCN.